writing excercise – building strength! I am in week 2 of my “creative writing” class. Saturday mornings lesson was to post a photo of you that you would not normally post, and describe yourself in 3 adjectives – take a risk, write about you, describe yourself in a riskful way, be creative yet take the fear by the neck and write about it. I chose this photo of me when I was at the height of my “body building”. I wouldn’t normally share this photo, so I guess I took the risk on that aspect. There are only very few people who have seen this photo, and it’s pretty much the photo I take out when I need to feel strong, or when I need to remind myself of where I can be, and how strong I can be internally as well. I believe I was even very shy about taking this photo and wanted it over and done with quick for my “before and after shots”. I had a website called “reflections of me” for the gym testimonials that were private between close friends and family, but it went public so I took it down. I am a shy person, until I get to know someone. I never like a photo of myself (hence the reason I change my profile photo so many times). I am never satisfied, always picking out my flaws, always feel I am not good enough, I put myself down alot.. but this photo reminds me of when I felt strong, and how I could feel internally. I actually can say I like this photo a little.. I really do! The only place I felt like I fit in was at the gym. 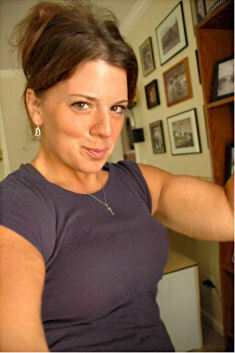 When I lost my 161 pounds, and started to weight lift, I felt powerful and strong. I felt like I had all this power over my past. When I lifted weights I would think about “them” a lot – the abusers. I thought about the abuse a lot. But not matter how many weights I lifted; I still knew the physical would never fix the emotional. The gym was my sanctuary at one time. It was a place where I could go and be whatever I wanted to be – flaws and all. I was accepted, I was rooted on, I was strong and people respected me. I could look absolutely horrible in the gym, and not be judged! The kind of pain I experienced in the gym was the GOOD pain, not the bad pain! It was the kind of pain that made you stronger, not weaker! It was the kind of pain I was in control of, not someone else’s control. I stopped lifting weights 2 years into my therapy. I found that it was getting harder and harder to be there physically, and then show up in therapy with Andy emotionally. I was to the point of complete exhaustion trying to pull of both – so I decided to take a leave from the weight lifting, and concentrate on my emotional healing. 3 years have passed and a huge part of me wants to try and do both – emotional and physical healing! But I am not quite there yet. I loved the feeling I had when I was at the gym. I loved how good I felt about myself, but I also remember how I felt leaving the gym, all my insecurities were right back, the shield was put back up, and I never thought I was good enough. Weight lifting was a very hard thing to do! You had to put all your energy and all your strength into it! I got to the point of bench pressing 150 pounds, and being able to push out 100 pushups in a row! I was at the top of my game. I was doing cross-fit training, I was doing 5k’s and people started to ask me on the street “wow do you lift weights?”.. But no one knew what was under it all! No one knew that no matter how much I lifted weights, no matter what I wore, how I looked, I still did not feel good about myself inside – I still hated myself, and even today I still struggle with my appearance and self worth. Today I still pick myself apart, feel gross about my body at times, but It’s getting a little better over time; learning to find my self worth within. Today I still go the gym, and workout, but I dont body build and lift like I used to, I tried, but it’s not there yet, it’s not there the way it was before, because internally something is still stopping me. I have learned over the years in therapy of why I feel this way about myself, and why it’s a struggle to love my body and myself – the abusers took that away, and I am trying to find it back. My therapist has tried to encourage me to get back into the weight lifting, but we both know that no matter how much I do it, I still need to feel good about myself “inside” to work hard again on the outside. I still cannot workout in front of the mirror, but I know I will get there someday. I am feeling closer to that. I am really coming out of my shell and starting to feel a little self-worth on the outside. I am starting to become less and less shy about my body. I am starting to look at myself more and say “you look pretty today”. I am trying hard to see that no matter what they did to me, I am still me, and I am GOOD enough. So, the risk? How will I feel having this post and photo up? I am already having anxiety about posting this photo and entry, but I guess this is a part of the internal work, just as much as the “creative writing” work. It’s healing and it’s taking a risk. If I was to describe myself in 3 adjectives? I would say “loving, quiet and funny” – I love to make jokes and prank with people, I have always been known to be a very quiet person, and I am very loving, I am compassionate and have compassion for other people. I love to love! The “strong” part is what I am working on again both internally and externally. Someday it will come back, and I will be both, but right now I am working on me, the inside of me, so that I can get back, look at myself in the mirror in the gym and say “I am worthy!”. Jeff goins writes, if you don’t feel uncomfortable writing this piece, you’re not vulnerable enough – MISSION ACCOMPLSHED. Karen, who would have known you had all that? that is what people dont get. You look at someone, and you think “wow, they are fit, they are healthy, they look good, they are pretty” .. but all that doesn’t matter if you dont feel it inside. What a risk you took today, and a good one. it may have been a “writing” risk, but it seems to me it was a personal and emotional risk”. Good for you! I do have to say, you had some pretty big guns there lol ! but we all know, nothing matters on the outside if it doesn’t match the inside (for us). Thank you Hanna lol .. I do have to admit, the anxiety I feel about having this post up is extreme.. but I am working with it! Working out and weight lifting was very emotional for me too.. I would have tears alot when I lifted weights with my trainer.. never did I know why, or why they were there. I do want to get back to it.. I am just not quite ready yet.. soon, someday soon! Karen wow.. so why did you stop lifting weights? you should have kept up with it.. it must have been hard to do both I guess.. well that and it’s hard working out, I try and I hate it LOL! I stopped weight lifting with a trainer 2 years into my therapy. Ruth my old trainer she helped me seek therapy.. I knew at that moment that I needed help inside.. but I kept working out, even when I was working on the emotional stuff in therapy.. While I was in therapy one day, I told my therapist that I couldn’t do the weight training AND do the emotional work.. it was taking a TOLL on me. When I was bringing out the emotional stuff inside, it was hard to have that confidence and go to the gym and workout.. it didn’t have the same effect on me.. I have tried going back to the gym a couple of times to try and weight lift again. In fact last year I went back to the gym and TRIED to do it again! kept saying I AM GETTING BACK INTO IT!! I tried – but I just CANNOT do it.. something is not the same, and I think it’s because I brought out all the emotinal stuff inside.. it just made me feel NOT as good about myself once I started talking about the past. When I was doing all the weight training.. I had moments where I felt GOOD but then knew something was wrong inside.. I am glad that my trainer RUTH ragged on me about working out in front of the mirror.. if it weren’t for her, I wouldn’th ave seeked therapy..
when I was doing both therapy and weight lifting, I was struggling to do both.. I would come into therapy and not want to work, or I would go into the gym and not want to lift.. I needed to choose.. I chose ME.. the gym can wait.. it’s more important to fix me.. the inside is more important than the out at this moment..
HEY KAREN.. I USED TO WEIGHT TRAIN TOO, IT’S NOT EASY AND YOUR RIGHT. MY TRAINER DID THE SAME THING, MADE ME WORKOUT IN FRONT OF THE MIRROR, I HATED IT, I KNOW HOW YOU FEEL. THANK YOU FOR SHARING YOUR STORY I HOPE YOU FIND THE LOVE FOR IT AGAIN. Hey Melissa – my original trainer was JOSE SANCHEZ. he is the one who used to get on me the most about the mirror, but I told him no. Ruth was mean, she made me do it ragardless. Part of working out and lifting weights, you need to look in the mirror to get a better form, I hated looking at myself. Still to this day I cannot do it if I go into the gym and try. SIS.. I remember the weight gain, I am surprised you shared this photo HAHAHA! I edited my story a little.. there were a few parts I forgot to add in about my testimonal website and other small things I forgot to add.. I think I was in a rush to put this up this morning .. honestly I can’t wait to write something new, to get past this one, I am still having anxiety over it!